We highlighted “10 Ways to Style an Asymmetrical Shawl” in the Summer 2017 issue of Love of Crochet magazine, but we didn’t have enough room in print to show all the ways to style the Maritime Stripes Shawl by Stefanie Bold. In fact, when styling the shawl on a dress form, we came up with twenty-four different looks. Here are our top fifteen favorite styles. 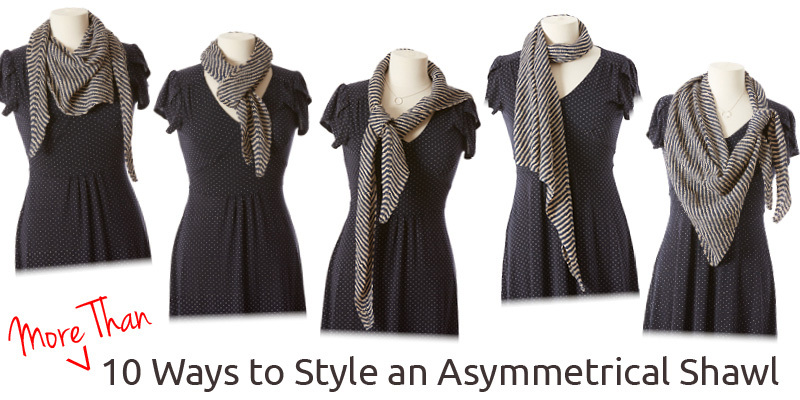 Asymmetrical shawls are particularly fun to style because their widest sections are off center. 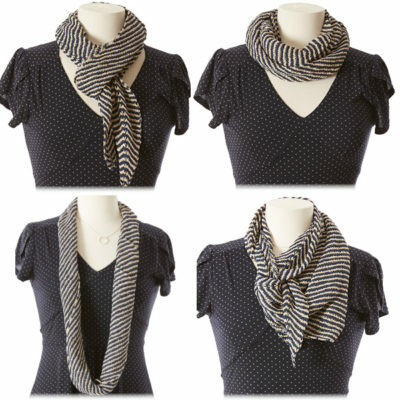 That intentional design feature lets you drape the shawl to accentuate or minimize the asymmetry. With the short stripe panel up, wrap the shawl across your back just at the top of your shoulder. Tie the ends in front with two overhand knots. 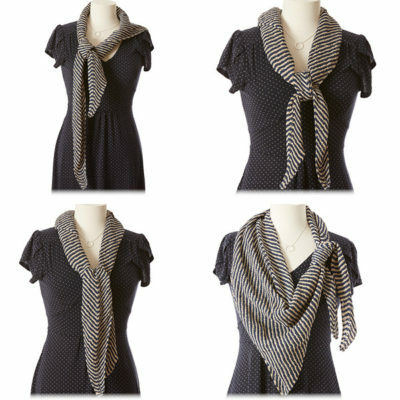 With the short stripe panel up, wrap the shawl across your back and over your shoulders. Tuck an end under each arm and tie them in back with two overhand knots. 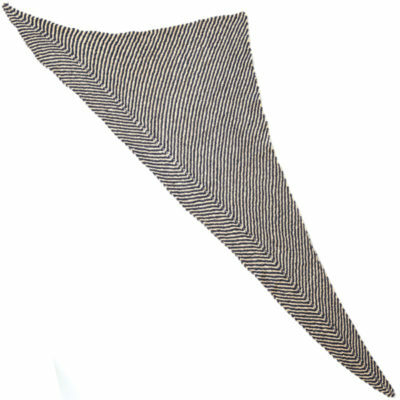 With the short stripe panel up, place the widest section of the shawl in front, then wrap each tail around the back of the neck and drape to the front. 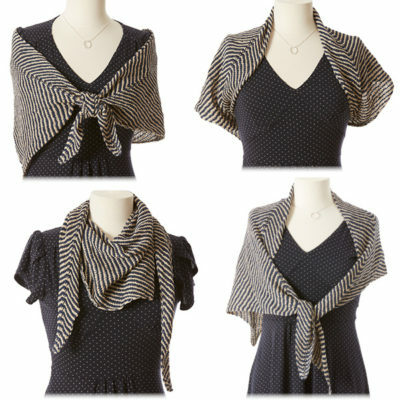 With the short stripe panel up, wrap the shawl across your back and over your shoulders. Tie the ends in front with an overhand knot. Starting at the widest side, roll the shawl into a long skinny tube. Fold in half. With fold at the front of your neck, wrap the tails around your neck and tuck them through the fold in front. Starting at the widest side, roll the shawl into a long skinny tube. Wrap the tube around your neck twice and tuck the ends into the wraps. Starting at the widest side, roll the shawl into a long skinny tube. Tie the ends together with two overhand knots and place them behind your neck. Fold the shawl in half lengthwise. With fold at front, wrap tails around neck. Bring one tail over and through the fold. Bring the other tail up from below and through the fold. Starting at the widest side, roll half of the shawl into a long skinny tube, leaving the point unrolled. Drape the point on your back, then bring the tails to the front and tie them with a loose overhand knot so they are at uneven lengths. Starting at the widest side, roll the shawl into a long skinny tube. Place the center at the back of your neck, then bring tails to the front and tie them in two overhand knots. Starting at the widest side, roll the shawl into a long skinny tube. Place the center at the back of your neck, then bring the tails to the front and tie them with one overhand knot. With the shawl point at the front, drape one tail around neck and tie the ends with two overhand knots at the side near your shoulder. Fold the short side of the shawl back over the main shawl twice, then drape it around the back of your neck. Fold the short side of the shawl back over the main shawl once, then drape it around the back of your neck. Place the skinny tail over your shoulder; wrap the shawl around your neck and allow the tail with the widest section drape to the front. Pick up your copy of Love of Crochet Summer 2017 and crochet your own stylish asymmetrical shawl!